There are plenty of P.E.I. 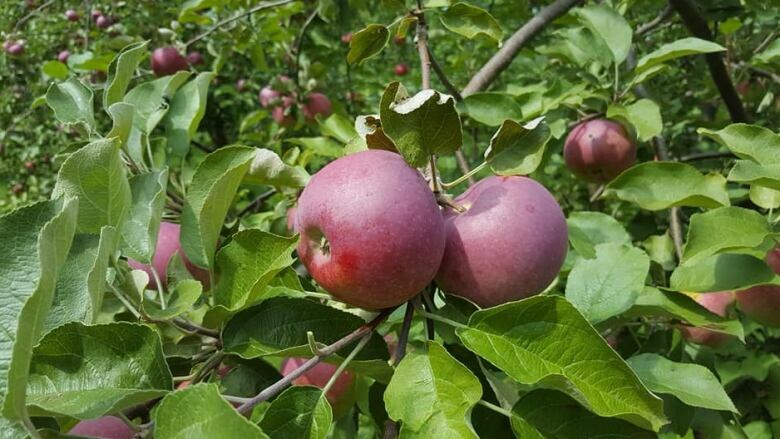 apples to go around, Island growers are reporting, despite an early June frost and an August hailstorm that both did some damage. 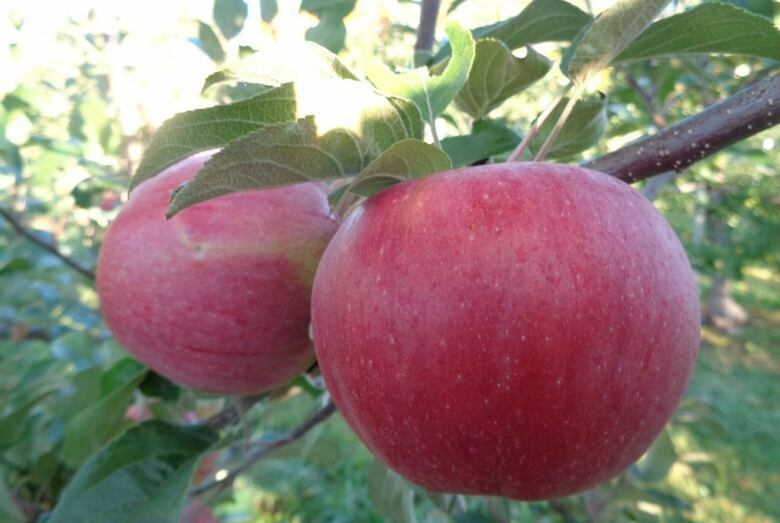 The apple crop across the Maritimes is reduced due to that frost — some farms in Windsor, N.S. lost as much as 80 per cent of their crop, while others in New Brunswick lost as much as 70 per cent. Blooms destined to become fruit died on the trees when temperatures dipped below freezing June 4. 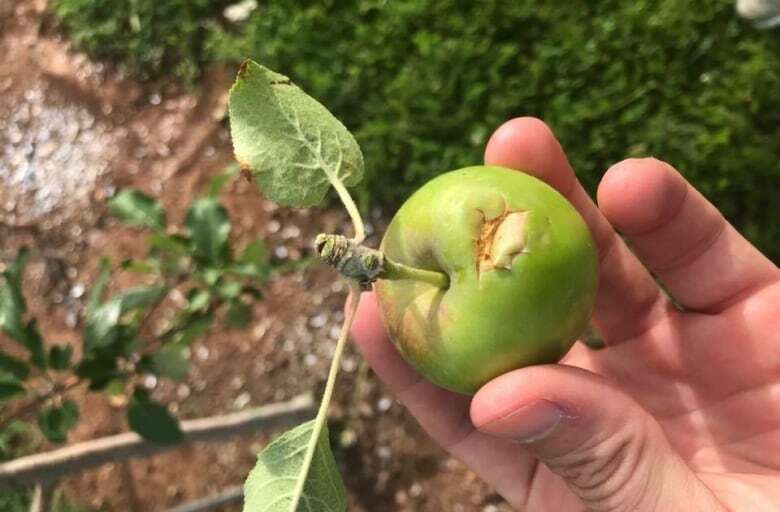 "It looked like little grenades hitting the apples," recalls Geoff Boyle of the hailstorm in August. 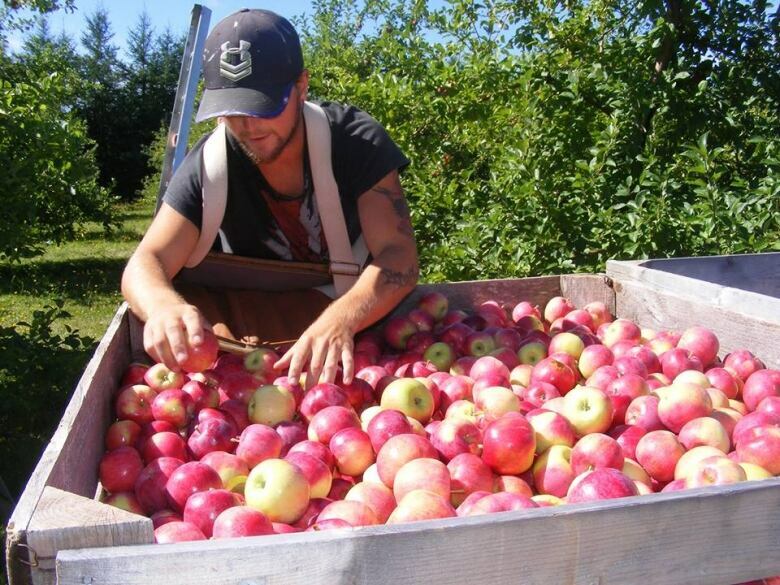 He owns The Grove Orchard & U-Pick in Cornwall, which has five hectares, or 12 acres, of apples. After losing some blooms to frost, Boyle said he was "pretty much distraught" when the hail came through and he saw most of his crop was damaged. "I thought it was total devastation at the time, but it was early enough in the apple development that it ended up just being a little mark on the apple." About half of Boyle's crop was destroyed in the two weather events. Because 80 per cent of its apples have small flaws, The Grove will have lower prices for its U-Pick apples, Boyle said. Some will also be juiced and given away for animal feed. "It won't be a banner year for us by any means," he said. Arlington Orchards near Tyne Valley lost about half its crop from the frost, says owner Barry Balsom. "It's a big orchard so we still have lots of apples," Balsom said — their U-Pick is ready for customers. However, for the first time in 15 years, the orchard won't export any apples off-Island, which will hurt their bottom line. "We're not going to make money this year but we're not going to lose money, and that's a good thing," Balsom said. Scottish couple launches craft cidery on P.E.I. Wintermoor Orchard in York was lucky — it avoided both the frost and hail and has a bumper crop. "A lot of the people that are coming are saying 'Oh I didn't expect the orchards to be open this year,'" said owner Mark Ashley, who is also the head of the P.E.I. Apple Growers' Association. He wants Islanders to know U-Picks are open and there are lots of apples to go around, and advises people call or check the orchards' Facebook pages to make sure the varieties they're looking for are available. "Somebody might have got hit with their Macs or their Honeycrisp, but if they are determined that they want that variety I think they'll find it at other farms," Ashley said, calling it a good opportunity to get out to new orchards across P.E.I. Richard Macphee at Macphee's Orchard in Cardigan said his crop is on par with last year's — thanks in no small part to an ingenious hack he devised. 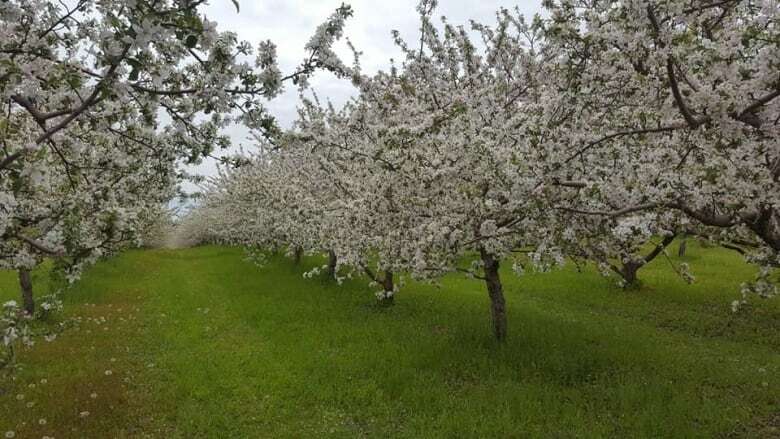 "Because our farm is small, we were able to spray water on the trees through the two nights of heavy frost June 4th and June 12th," he explained. The farm has more than 5,000 trees on five-and-a-half hectares, or 14 acres. "We thought we would try something instead of just thinking there was nothing we could do about the frost." The effort paid off, he said, as the few "control trees" they didn't spray down bore almost no apples.